Serving customers for over 12 years, those who call Go Mini's are likely to speak with one of the company owners, Bob Jones, who prides himself on delivering friendly, local customer service. (PRLEAP.COM) Louisville, KY. April 16, 2019 - Go Mini's provides customers with portable storage containers that are ideal for household moves and renovation projects. With three container sizes available for rent, the Go Mini's mission is to provide a smooth and efficient moving or storage experience for customers across Louisville, Kentucky and Southern Indiana. "As the co-owner of Go Mini's Portable Storage here in Louisville, it is my goal to make our company stand out from the crowd. We do this in two ways – we work hard to deliver the very best customer service available. This means we hope to exceed your expectations making it as easy as possible for you to rent our clean and affordable portable storage containers. We also offer a unique product that no other company in the region provides. We're the only portable storage company in Louisville that offers a 20 ft unit. This convenient size enables many of our customers to rent just one container, not two." Go Mini's of Louisville has a unique business model which sets them apart from other moving and storage companies in the area. Popular for residential use, Go Mini's portable containers are a more efficient alternative for those staging, renovating, building or moving to a new home than traditional moving trucks or storage units. In light of the spring season, an optimal time for moving, cleaning and renovating, Go Mini's of Louisville is offering an unprecedented springtime special. All of Go Mini's storage containers will be rented out for just $99 a month until the end of May, no matter the size. The deal includes a 3-month minimum and a $49 fee for every delivery, pick up or transfer. The savings of this spring sale amounts to as much as 50% off Go Mini's largest 20 foot container. 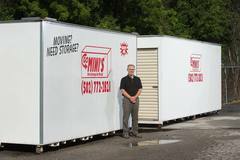 As the only company in the Louisville, KY-area to offer a 20 foot portable moving or storage container, the 20 foot unit is Go Mini's most popular size, providing more tie down locations and 29% more loading space than competitor's largest units. While Go Mini also has 12 and 16 foot containers available for rent, the 20 foot enables customers requiring more space the ability to rent only one container. The 12 foot Go Mini holds 2-3 rooms of furniture, while the 16 foot can fit 3-4 rooms of items, and the 20 foot as much as 5-6 rooms of objects. When closing dates or new construction do not allow for a direct move, Go Mini's mobile storage units provide a place to keep one's belongings without the hassle of having to load or unload more than once. Containers can be kept at the customer's location or in Go Mini's secure Louisville warehouse. The monthly rental price is the same no matter where the portable container is located. If staging, renovating or remodeling a home, a Go Mini offers the convenience of temporary onsite storage. Each unit can be delivered quickly to the customer's doorstep, and is left until they load it, ask to move it or store it; requiring less handling on their part. Go Mini's also services commercial contractors who need more interior workspace, are relocating, have excess inventory, seasonal items or are remodeling and need to store fixtures and clear space on a job site. Additionally, Go Mini's has become the leading provider of portable storage for restoration and disaster contractors in Kentucky and Southern Indiana by providing 24/7 service with one point of contact. Go Mini's portable containers are always delivered at ground level for an easier loading experience and come with padded wheels for soft contact on any driveway surface. Each unit is built to remain clean and dry and features vents to reduce moisture from humidity. Go Mini's come complete with sturdy railings, a translucent roof that provides natural light inside the container, as well as a rollup door and loading deck for easy access. For help loading or unloading, Go Mini offers a free referral to a local professional moving service. Having referred customers to them for many years, their experience allows them the ability to pack as much as two times more in a Go Mini container. In addition, Go Mini's also provides a variety of moving supplies for rent. Flat and upright dolly's as well as packing items such as padlocks, boxes, tape, tie down straps, bubble padding and quilted moving blankets can help protect one's belongings from damage while in transit. Go Mini's happily services customers across Louisville, Kentucky, Southern Indiana as well as the surrounding counties and cities. To learn more about Go Mini's of Louisville or to determine what size container would best suit your needs, visit the Go Mini's website or call 502-772-2821. Go Mini's of Louisville is a part of Moon Companies, one of Kentucky's largest full-service trailer, dumpster and portable storage leasing companies. In addition to providing mobile moving and storage containers, Moon Companies has a large inventory of portable restrooms and restroom trailers, dumpsters and refrigerated containers available for individual or commercial use. Moon Companies also offers grease trap cleaning to area businesses, secure warehouse storage, mobile office space, as well as shipping containers and storage trailers for rent in Louisville, Kentucky, Indiana and regions beyond. Having been in operation since 1992, the company is known for fair prices and exceptional service as denoted by their tagline: "Ask for the Moon and get it!" To reserve a portable storage container and take advantage of this spring special, visit Go Mini's of Louisville online or call 502-772-2821.